Demonstrate a commitment to food safety. Document your organization’s food safety policy. Support the establishment of a complete FSMS. Define the scope and boundaries of your FSMS. Plan the establishment of your organization’s FSMS. Document FSMS responsibilities and authorities. Appoint your organization’s food safety team leader. Appoint your organization’s food safety team. Establish food safety communication arrangements. Provide the resources that your FSMS needs. Provide competent food safety personnel. Provide training and awareness programs. Provide infrastructure and work environment. Establish your prerequisite programs (PRPs). Perform a food safety hazard analysis. Document your food safety hazards. Assess your food safety hazards. Select measures to control hazards. Establish operational prerequisite programs (OPRPs). Prepare your organization’s unique HACCP plan. Establish a product lot traceability system. Develop food safety emergency procedures. Identify and correct nonconforming products. Evaluate data and take corrective actions. Control products that are potentially unsafe. Control your monitoring and measuring methods. Validate your food safety control measures. Verify that your FSMS has been implemented. Evaluate the results of your verification activities. Perform regular internal audits of your FSMS. Carry out food safety management reviews. Document your organization’s unique FSMS. Control food safety management documents. Control your food safety management records. Continually update and improve your FSMS. plan, please see our plain English standard (Parts 4 to 8). find it easier and more efficient to use a gap analysis approach, instead. 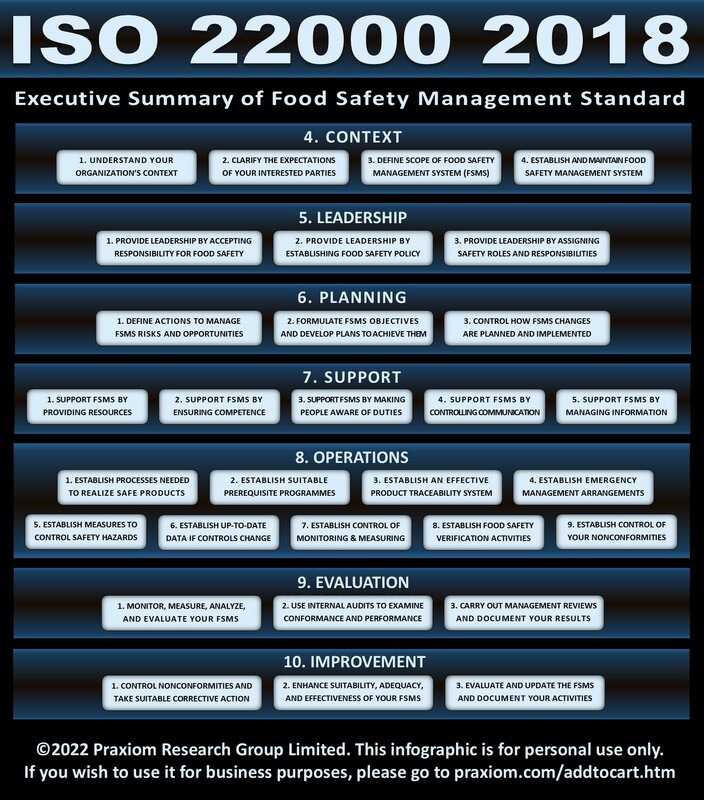 gaps, you will soon comply with the ISO 22000 standard. approach and ignores areas that already comply with the standard. Updated on November 30, 2013. First published on January 5, 2007.